And the angel of the LORD admonished Joshua, saying, “Thus says the LORD of hosts, ‘If you will walk in My ways and if you will perform My laws, then you will also govern My house and also have charge of My courts, and I will grant you free access among these who are standing here” (Zechariah 3:6-7). We saw last time how there is a progression here in the things that Joshua is required to do if he is to enjoy free access to the heavenly realms. It begins with walking in God’s ways and continues with performing His laws. We will go on to look at those heavenly realms to which he would have access, but first let’s touch on those laws. The laws are not the Ten Commandments. They are ‘laws’ in the sense of ‘principles’, and they describe how God works within His kingdom. These are principles of how God operates and how we should operate in the kingdom. Like Joshua, when we start to do so, we gain free access to the realms of heaven. I want to share with you a representation of those realms of heaven, so that you have some idea of how these realms relate to each other. It is only a representation though, and our understanding of this is developing all the time. You will see that there are realms under the earth. In fact, there are three realms into the earth, three realms into the kingdom of heaven (into God’s kingdom, a kingdom that was given to Adam), and there is the atmosphere in between them, making seven. You will always find sevens in the things of God, because seven speaks of completion and is the perfect number. 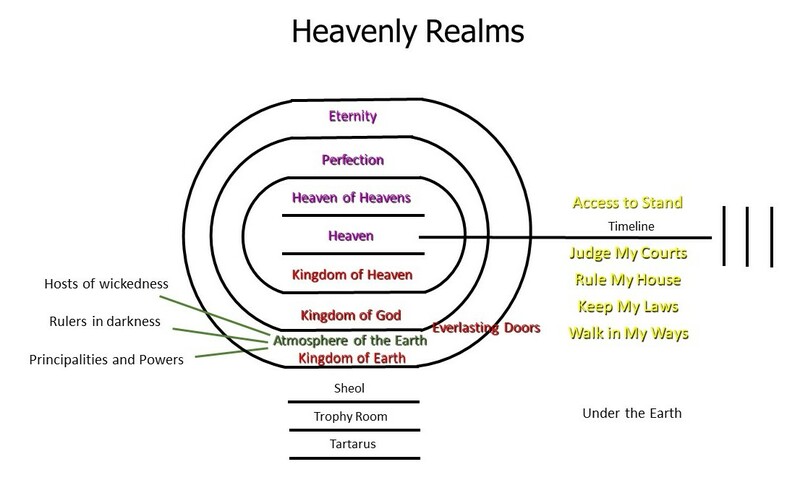 Each heavenly realm has seven dimensions or levels of authority within it. I don’t know what they all are yet, but I do know that they are linked to the court structure (covered in the last session of the Transformation series, available on our website). Within the atmosphere of the earth there are three realms (Greek thinking would see them as layers, but they are not), realms of God’s kingdom rule, and you will see the kingdom of earth where we experience the presence of God. Within this atmosphere is the area where we are supposed to rule: it is in darkness. Under the earth, there are various places: Sheol, and Satan’s trophy room, and Tartarus, where certain angels are wrapped up. There are other places there too, but I am not going to deal with them here. It is important to grasp that you do not have to go ‘through’ one realm to get to another. That again is Greek thinking. God has shown me places in many of these realms, and it is only over time that I have come to understand where they are located. Let’s look at some scriptures, because we need to look at beginnings to see how some of this took place. In the beginning (Gen 1:1) God created the heavens and the earth. He created the heavens first. The heavens were not just physical, they were all those realms we have just been looking at: realms of His kingdom, realms of His authority. The kingdom is all about authority, government and rule. Adam was supposed to bring what was in those realms onto earth. Earth was supposed to reflect heaven. Earth was not in the same place as we know it now. This was before time: in fact time didn’t exist at this point. And he created sons of God, which were the angels, particularly the ben elohim, who were preparing Earth for Man. Now we have verse 2: The earth was formless and void, and darkness was over the surface of the deep, and the Spirit of God was moving over the surface of the waters. But God did not create it that way. Something happened between God creating the heavens and the earth and the earth becoming formless and void. What happened was this: Satan fell. This was before Adam was created. The Spirit was hovering, resonating, over the surface of the waters. The fact that the whole planet was covered with waters indicates that there had been judgment. God did not create it like that. For by Him all things were created that are in heaven and that are on earth, visible and invisible, whether thrones or dominions or principalities or powers. All things were created through Him and for Him (Col 1:16). Everything was created for Jesus. Thrones, dominions, principalities and powers are not the names of demons. They are not the names of fallen angels (although fallen angels do presently operate in those realms of authority and power). So all these things – thrones, dominions, principalities, powers – were created for Jesus. ‘All things visible and invisible’ were created for Him: but things which are invisible to us now, to the natural eye, were not invisible to the spiritual eye for Adam. The kingdom government is the heavens come on earth. It is all about bringing about on earth a reflection of what is in heaven. Whatever you see in heaven, those are the things God wants to see worked out in us. The principles of heaven need to be reflected in our own lives, and then in the world around us (starting with our spheres of influence). Everything that is in heaven, God wants to bring on earth. For thus says the LORD, who created the heavens (He is the God who formed the earth and made it, He established it and did not create it a waste place, but formed it to be inhabited), “I am the LORD, and there is none else” (Isa 45:18). He did not create it a waste place. This is the account of the heavens and the earth when they were created, in the day that the LORD God made earth and heaven (Gen 2:4). Do you see how the two halves of this verse are referring to different things? There is ‘created the heavens and the earth’ and then there is ‘made earth and heaven’. He originally created it, then something happened to spoil it (and we have seen what that was); and out of the formlessness and void, He made earth and heaven. In the original creation, there were no stars, planets and galaxies as we know them now. They didn’t exist in that creation because earth was in the centre of that circle, with a direct, seamless connection to heaven. Earth always was (and still is) intended to be connected to heaven. Now, as we know, Adam had access to walk with God. The earth, in the centre of everything, was connected to the realm of heaven. There was an overlap between Eden (the garden of God), and the garden God planted for Adam. That meant that Adam had access to every realm in our diagram from under the earth upwards, up to and including the realm of Heaven. After the fall everything was moved out into time and space, and the earth was no longer connected to heaven in the same way. The earth’s axis moved and everything became elliptical rather than circular, right down to the orbit of electrons around the nucleus of the atom. If Adam had not fallen, and if he had taken the Tree of Life (which was the pathway to life), he would have had access to the higher realms: Heaven of heavens, Perfection, and Eternity. But as we know, he chose a different pathway. * The Law of First Mention sets the precedent for how we should interpret a particular word or phrase throughout the scriptures. 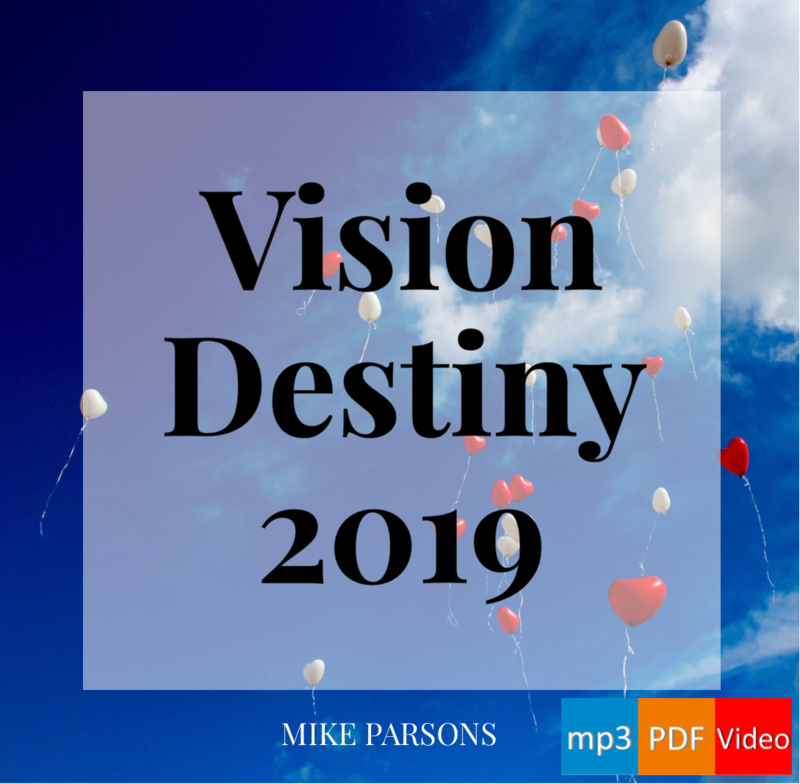 Since everything is always a circle with God, in many cases we have to go back to Genesis if we are to properly understand what comes about in Revelation.